A dealer advertisement from 1963 for the “Sewhandy” Singer Sewing Machines toy line from The A. C. Gilbert Company. The “Sewhandy” Electric (model #14325) was powered by a 115-volt electric motor. 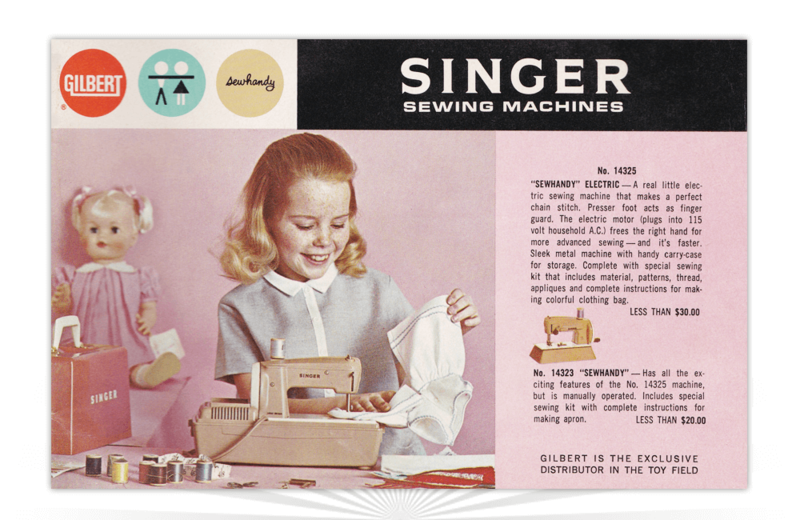 The metal machine came with a carry-case for storage and a sewing kit that included material, patterns, thread, appliques, and instructions for making a clothing bag. The “Sewhandy” (model #14323) had all the features of its more expensive counterpart but was manually operated. The included sewing kit swapped in instructions for making an apron. A vintage comic book ad for Silly Putty - "The Wonder Toy of the Twentieth Century."